This dessert is the very definition of laid-back and chill, not just because it is quick and easy to make. but also from having come to pass as the result of a happy accident, as many of the best recipes do. It was the result of Draft 1 of my Pumpkin Chocolate Chip Cookie Bars recipe. As you can see, this dark, rich, fluffy cake does not at all resemble dense, chewy, pumpkin-y cookie bars! I am admittedly a novice when it comes to understanding the science of baking, so creating recipes for baked goods skews high on the error side of the whole trial-and-error rigamarole for me. I’ll try to hash out what I think should be the correct ingredients and proportions, then I’ll look at several other similar recipes online to see how right those guesses are. But I want to avoid copying someone’s recipe, so I’m perhaps overly careful about absorbing too much from others more expert than me and will make my best guesses as to what ratios of flour and baking soda and eggs and whatnot should be used. The results are not always pretty, but in this case, my naïveté had an excellent payout. I wanted cookie bars; what I saw when I opened my oven was straight-up cake: dark, lustrous, chocolate-chip studded cake. The pan of cookie, rather than being dense and chewy, had puffed up and risen. I was disappointed, but then when I tasted it, I was like, hmmm, this is not half bad. Let me take another bite, and another . . . and WOW, this is actually quite good! The more I ate the accidental cake, the more I loved it. This was my first time baking with molasses; I chose it because it’s supposed to be better for us than white processed sugar, having a lower glycemic index and being richer in vitamins and minerals (especially blackstrap molasses, which is the most nutrient-rich – in iron, magnesium, copper, zinc, potassium, to name some notable ones – but is also the least sweet of all of the molasses varieties. I used standard unsulphered molasses in this recipe, not blackstrap, but if you give the latter a whirl while making this recipe, please post your reactions to it in the comments field!). Molasses’ flavor is definitely distinct, and I wasn’t initially sure that I liked how much it stood out in the recipe. I couldn’t taste the pumpkin puree in the cake at all. But the more cake I ate, the more I realized, no, it is perfect. 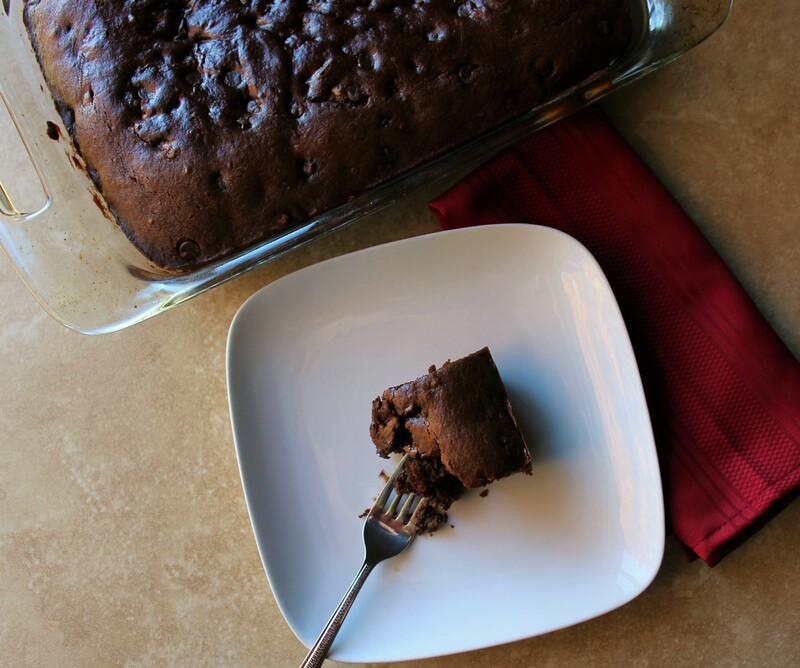 The molasses flavor is so rich and decadent; it pairs well with the chocolate chips (of which I used an organic variety for the first time while making this recipe – bonus points! I was so happy to find that my local supermarket chain, Meijer, now offers its own brand of them. Holla, Meijer! By using organic chocolate chips in your recipe, you can avoid the highly processed conventional chips that contain the very-likely GMO-infused ingredient, soy lecithin). And while you really can’t taste the pumpkin puree, it gives the cake an incredibly moistness. I toyed with the idea of adding traditional pumpkin pie spices – nutmeg, allspice, and ginger – to amp the association with pumpkin – but in the end, I just couldn’t do it. Draft 1 of the recipe solely contained cinnamon – and I liked it that way. So I’ve kept the recipe as-is. To be honest, while I LOVE pumpkin pie, and I loved how the pumpkin pie spices turned out in my recent cookie recipe, I’m a little leery about baking with them. They are all robust spices that can go from pleasantly distinct to screamingly overbearing in one careless dash. I learned the hard way when I was in my mid-20s upon using a granola recipe that prominently featured nutmeg that I am NOT a fan of it in large quantities. Much of that granola inevitably ended up in the garbage. If you are a champion of the pumpkin spices and would like to experiment with adding the ground nutmeg, allspice, and ginger in addition to the cinnamon to this recipe, I’d recommend adding no more than 1/2 tsp. of each to the batter and tasting it to see what you think. You can always add more, but you can’t take it away! In a large mixing bowl, combine the dry ingredients: the flour, baking soda, cinnamon, and sea salt. To another bowl, add the egg; beat well. Then whisk in the molasses, pumpkin puree, melted butter, and vanilla extract. After thoroughly combined, add those wet ingredients to the bowl with the dry ingredients; mix well. Finally, stir in the chocolate chips and walnuts.